Put NASA-invented technology to work for you with the Thermo Sensitive Memory Foam Seat Cushion. High-density foam cushioning lines the length of the back and up the neck, helping to relieve pressure and ease pressure points on your thighs, waist, back and neck. An elastic strapping system fits all types of car seats and high-back chairs, and it helps keep the seat in place all day long. High-density foam cushions the entire length of the back and neck. Elastic strapping system holds the seat in place. 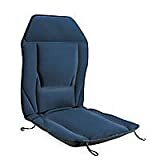 Versatile design fits all types of car seats and high-back chairs. Memory Foam CVC velour fabric. Care: Wipe down with a dry cloth.